Whip vines drink blood. They look simply like long, very thorny green vines, but they conceal a round sac, buried deep in the ground or kept high in the air, that acts as a simple “brain” for the organism. Whip vines sense movement with great accuracy. Any movement nearby causes the whip vines to animate, whipping back and forth, whereupon the vines do two things: open fresh wounds in the victim, and stick to said victim, leeching the blood from its wounds. Whip sacs germinate by generating dandelion-like seeds in a separate sac that grows out of the plant once per year, growing high in the air, then bursts and distributes the seeds on the wind. Intelligent monsters often harvest whip vine seeds and plant them around their lairs, leaving a few open spots for their own entry and exit. Don’t worry about statting up whip vines; just steal stats from another monster of appropriate level for your party, along with a standard attack. 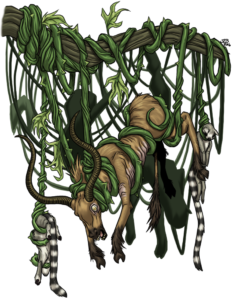 The danger of whip vines don’t lie in their damage; it lies in the facts that they slow movement (half speed) and that the noise they cause alerts nearby monsters to the presence of enemies. Those monsters can then fire ranged weapons at the intruders who are still fighting through the whip vines, making them very effective at whittling down a group of adventurers.